I’m sitting under a tent on a more beautiful day than we could have imagined, and I am so happy . . . and so desperately sad. At the opening ceremony this morning, they called forward all the survivors. I was struck, first, by all the kinds of cancers that there are (Who knew there was nasal cancer and back cancer?) and then it hit me – that for each of these wonderful, amazing people who survived there were more that had not . . . like my mom. This isn’t a huge Relay – but still over 100 survivors took to the track for the first lap. What does that say about how many didn’t make it to this day? Next to our tent is a campsite full of breast cancer survivors – The Bosom Buddies – all women over 60 who have beat this disease. 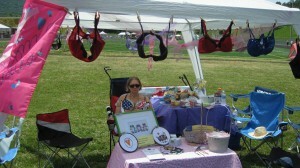 Their tent is decorated with bras (most of which are impressive in cup size, if I do say so myself) and each of them has donned a t-shirt that sports a woman in a bikini, making it look like they are so wonderfully scantily clad themselves. 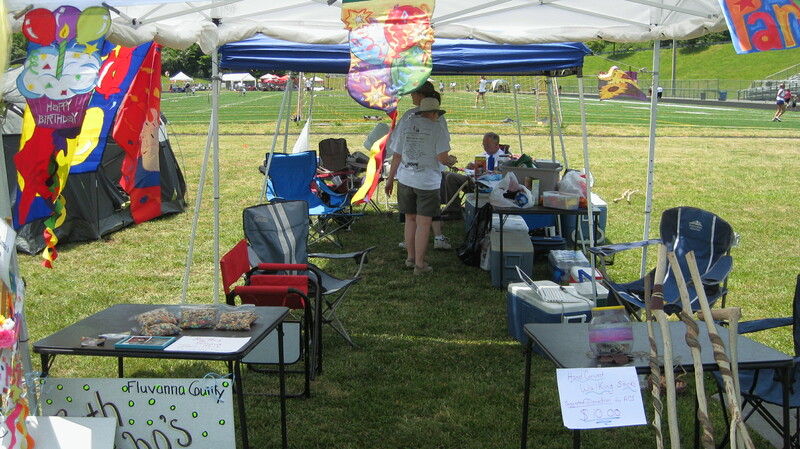 Our tent is a birthday theme – ACS celebrates giving people “more birthdays” – and we’ve put out Mom’s trail mix and Dad’s walking sticks as fundraisers. We’re all a little subdued today – it’s only been six months after all. But I wouldn’t want to be anywhere else today. Rolling coins that the high schoolers donated, watching Mom’s best friend and my dad sand walking sticks, seeing other friends pound the track with passion . . . it’s just what Mom would have loved and never done for herself. I”m glad we can do it for her. We have crushed our $3,000 goal, but because we want to crush this disease, too, we’ve raised our goal to $5,000. We want to raise this by 8am tomorrow. If you’d like to help, donate here and help us give people lots more birthdays.